Link to our magical Spreadsheet! Remember this is an open-edit document. Meaning people should feel free to contribute new video sources, new translations, and updates. For the most part, the color formatting is automatic and will appear as you type in the relevant information. M: We have arrived at the key moment of the event. Yuzuru Hanyu is about to skate, almost 24 years old, current Olympic Champion, he won the Olympics twice, he was World Champion twice, he won the GPF four times. But he never won the third GP. He only won the sixth GP. He's one of the strongest skaters ever, if not the strongest. Let's see what he will show us today. This program is in honor of one of his idols growing up, Johnny Weir. A: He skated to this music, Otonal. M: -whom (Johnny) is not the only high profile skater who skated to this music. We remember some high level female skaters, and more. Let's watch him. A: Music by Raul di Blasio. A: 4S. Preceded by elaborated steps, inside SE. Max: +4 from everyone, for some +5. A: 4T3T, with a turn on the landing. First program with 2 quadruples landed today. M: And Hanyu decides to raise the bar! Approximately, it should be the best program skated in the GP, and not only there. A: An element is missing - now it's in. Close to 60 points of TES. M: So what has changed from the program shown at ACI and this one? Firstly, the combination has been moved to the second half of the program, the music cut is different, the spins were more refined. Let's say that, by his standards, he left some points behind on the 3A, which normally is +5, because you cannot give anything else to that element when Hanyu does it - but in this case it was not perfect, although he managed to hide the imprecision. It's still a high profile program. The best score of the season is 104.15, we should be over that. A: very likely, this is a program with a high technical difficulty, two quadruples executed, Salchow was amazing, very good on the Axel because he hid the uncertainty (in the landing), the 4T was also perfect, on the 3T he was undecided and did a little turn, so clearly the GOE wasn't the highest, even though there was a difficult entrance and the execution of the jump was very good. Especially the 4T. M: The highlight of the program I'd say is the Salchow and the Step Sequence, which we won't talk too much about, but here it was brought to a superior level. A: Yes, skated with an excellent quality, but only a level 3. So there are some points there as well for him to take in the future. This is the 3A. A little down on the weight, but... it's scary how he can always find the correct position back again. 4T was perfect, on the 3T slightly out of Axis. M: There isn't even the turn. A: He... he hides it, he makes it choreographic. Even if the exit didn't have good speed, there were no minus GOE. M: This program is growing, and after 2.50 minutes - because this program is 2 minutes 50, so at the limit of the time lenght, you would want for it to continue, to see more. A: Yes, so much quality in everything that he presented. We saw the choreographic jump in the Step Sequence which was spectacular, a sort of open Axel landed with the other foot. M: What can we give in PCS? He got 45.40 at the ACI in Ontario, and here, he skated definitely better, no big mistakes, the program is richer. Going below 9 seems complicated. He should have more than 9. A: Let's see if he can get 46-47. M: I think that should be the right score, 47. Let's wait. 47.60, 106.69, best score of the season, best TES, best PCS, "what else"? A: *Laughs* Yes, someone else would say that. Great performance. We already saw a great program with Brezina, but the highlight had yet to come, and it was this. M: And the point gap is pretty big, 13 points. Is this the right thread for translations of past competitions, too? Sorry if I'm posting in the wrong thread! In any case, I just realized that there was a 'translation request' tab in the spreadsheet, and that there were actually ones I could (mostly) do! Woman 1 (W1): For today's Men's short program, in the rink we have the superstar of figure skating, Yuzuru Hanyu. This year at Autumn Classic, he set a new WR with a score of 112.72. Woman 2 (W2): 4Lo. His landing was a bit flawed. Flying camel spin. Change foot sit spin. Beautiful 3A. 4T+3T, too bad about the fall at the end. Step sequence. Change foot combination spin for the final spin. W2: It's raining Winnie the Poohs! W1: Yes (laughs), the ice is covered with cute Winnie the Pooh stuffed animals tossed in by fans, and they're coming in from all sides of the rink. Yuzuru Hanyu -- earlier in the broadcast we had mentioned that his SP of 112.72 at his first competition of the season, Autumn Classic, had set a new WR. And now we can see one of the cute flower boys, here to help pick up the Poohs, taking the opportunity to interact with Yuzuru. W1: For these very young Russian athletes, meeting Yuzuru is just like meeting a big celebrity or idol. And it looks like it's going to take a while for these young Russian skaters to pick up all the Poohs! For Yuzuru, this season is especially important: In the 2014 Sochi Olympics he won the gold medal in the men's discipline and became the second youngest male skater in history to do so. (She says something else about his current condition and the upcoming olympics, but I couldn't quite make sense of it). W2: The opening 4Lo. He almost fell on that landing, but thankfully he held on to it. The main difference between him and Nathan Chen, in my opinion, is the nature/character of their performances. Yuzuru's feels more introverted, and his interactions with the audience isn't as good as Nathan's. W1: Whereas Nathan's performance style is more wild and communicates more directly to the audience, Yuzuru's performance style perhaps requires more of the audience's own input in order for them to experience what it is he wants to express. W2: Yes, it feels like his inner world is broader. W1: And of course, these are only our own opinions. There are reasons why both athletes each have so many fans. W1: For Yuzuru, before this competition there were many people who were concerned about the injury to his right knee. But in an interview after landing in Moscow, he explained that he doesn't feel much of an impact from the injury, so it won't affect the level of difficulty to his planned programs for this competition. And now let's take a look at Yuzuru's score for the short program: TES of 49.24, PCS of 46.61, with a -1 deduction, for a total short program score of 94.85. He is currently in second place. And that brings us to a close for the COR Men's short program event. Currently in first place we have US' Nathan Chen with 100.54, who is also the only skater out of 12 to have scored over 100. In second we have Yuzuru Hanyu with 94.85, in third is Russia's Dmitri Aliev, and in fourth also from Russia is Mikhail Kolyada. W2: And coming up next is someone who, regardless of which competition, is always the most popular: Yuzuru Hanyu. He is 22 this year, and earlier in his short program there were some mistakes, but regardless he scored a healthy 94.85 and is currently in second place. Let us now sit back and enjoy the free skate brought to us by Yuzuru Hanyu from Japan. W1: Beautiful 4Lz from Hanyu. W2: 4Lo [it was actually a popped 3Lo]. 3F. FCCoSp. Stsq. 4S. 2T. 4T+3T. 3A+2T. Another 3A. FCSSp. ChSq. CCoSp for the final spin. Yuzuru didn't perform perfectly today, but the technical level of his jumps is still shocking. W1: And now in the rink we see another sea of Poohs. It's a special feature that occurs after every time Yuzuru performs. 2014 Olympic champion Yuzuru Hanyu successfully completes his free skate. This season, for both SP and FS he will be reusing music from last season. Earlier there were rumors of injury to his right knee. He has said himself that it won't affect his performance much, but still his fans will worry. All in all, he's performed rather well here. Ah, and this young skater here, after the short program he had also gone up to Yuzuru to give him a drawing he's made of his idol. (laughs) Cute. Today, he didn't complete all the jumps he had originally planned, and he will probably feel a bit of regret for not performing his program to his full expectations. W2: (laughs) He touched his Pooh. 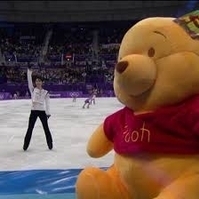 W1: Yes, he had to give a squeeze to his Pooh before skating. W2: The distance of his 4Lz is astounding. And to be able to land it with such a deep knee bend, it's very impressive. 4S, his knee was bent almost all the way, and still he was able to hang on. 4T+3T. W1: Currently, the WR for Men's SP, FS, and total are all held by Yuzuru. The FS WR of 223.20 was set in 2017 WC. After Yuzuru's FS, the audience and coaching team are all quite happy. His SP was 94.85, putting him in second. This season's GP, he will be competing both here in Russia as well as NHK Trophy. He's also one of the big favorites leading up to this season's Olympics. Let's see how he scored in today's FS: TES 101.54, PCS 94.38, for a total of 195.92. This is his current SB. His total competition score is 290.77, which went above Kolyada's to place him in first. Woman (W): Yuzuru Hanyu has arrived on the ice. This time he ended up placing second. This athlete is one who, the moment he shows up, becomes the center of everyone's attention. M: Ina Bauer. Combination spin. Hydroblade. 1A, beautiful. 3A, beautiful. Flying camel. W: A performance by Japan's skating superstar, Yuzuru Hanyu. This athlete is certainly one of the favorites to win gold at the Pyeongchang Olympics. This time, in an interview after placing second here at CoR, he has especially stated that even though he was unable to win gold here, being able to go through each of the elements and to get a feel for the choreography and other movements in competition is actually the most important. M: Yes, especially as in the FS he added in a 4Lz. That's a very difficult jump, and he also has 4Lo, 4S, and 4T in the program, making the technical base of his FS incredibly high. You can see from Yuzuru's performance here that he used many seesaws, choctaws, and turns in both directions for his steps, and he also did a SE and IB to transition. His arms, too, are swan-like, and Yuzuru Hanyu's Swan Lake [?] is very good. He also jumped a 1A, which was very very very high and beautiful, as well as a 3A, for a wonderful performance as a whole. Oda's commentary for Yuzuru's SP. Announcer: The biggest cheer of the day, this is new challenge of the Olympic Champion, Yuzuru Hanyu, he finished his SP. Oda: 4S at the start was really perfect. I won't be surprised if it gets +4 or +5 on it, it was a high level of perfection. He did it with difficult entry of inside-eagle, which would be the subject of +GOE. A: After SP at ACI of September, he had "kuyashii" face because his jump was a little shaky and had failure on the spin. But he put jumps (I can't hear him clearly but he said "jumps") together sufficiently. O: Yes. The jumps were so great. In fact, he almost had a overturn after 4T3T but he showed a turn lightly as if it was a part of choreography. That seemed like typical of Hanyu-senshu. That (combination) jump itself had high quality which leads to +GOE. A: In this Ice Hall of Helsinki, there are not only Hanyu fans from Japan but also many from European and Western countries. O: I also think the elements other than jumps were also wonderful. Speed of spins was fast enough, and he used his body a lot during the steps, so I think those will be getting from +3 to +4 of GOE. A: Let's take a look from the jumps. O: 4S from inside-eagle, good height, awesome. This 3A from twizzle, he is doing this from difficult entry so it will get + GOE, but its axis was a little lean and I held my breath, but it was beautiful, +GOE. (4T3T) 4T after consecutive turns, here, he almost had a overturn but 4T3T, he fully rotated it. It was very Hanyu-senshu that he did it like a choreography. A: The music Mr. Johnny Weir used he admired once, he said he wanted to skate and enjoy it. What kind of impression did you have in the step sequence? O: There was one scene that he made a big jump during the steps, and I think it was very effective as music expression. That also connects to +GOE for the step sequence, it was a good movement. Max & Angelo, proving once again that they know Yuzu more than any other commentator. will perform. The best strategy might be to simplify his Free, but we're talking about Yuzuru Hanyu here, one of the best figure skaters ever, if not the best. Let's see. This is a tribute to Plushenko, and in some way to Russia too. Angelo: Quadruple Salchow. So, a change of the program. A: Quad toe - Euler - triple Salchow. Incredible. Practically after an error, he pulls out this combination. A: Triple Axel. With a fall. A: He has one more Axel available. M: He rightly simplified the program. M: And that's a sign of great intelligence. He skated with an evidently messed up ankle. The start was terrific though, because he virtually perfectly executed the 4S and 4T. We even saw some +5 from the judges. There's one element to review - the combination 4T-Eu-3S. But he obtains 80 points in TES, if he gets around 90 PCS this is a Free of around 170 points if that TES remains as it is. Which means he'll win this competition. Let's hope that the ankle wasn't exposed to too much stress. Because the Grand Prix Final is in less than 3 weeks. A: 2-3 weeks yes. Two and a half weeks. A: Indeed, he did really good to simplify (the content), he would have won this competition only with triples. Of course, he made some mistakes, including on the Axel which is normally an element that requires a lot of power, it happens. He was clearly very tired in the last part. He's shaking his head because, of course, he knows that his performance wasn't exceptional, but I find the strategy correct, to try and preserve himself as much as possible. And the quality on the first two elements is in fact extraordinary. Also the capability to fight for that combination, 4T-Eu-3S. This is the first 4S. Spectacular. M: In fact, for the judges, the first call on this element was +4/+5. M: In the end he executed three quads. The 3A wasn't there. A: There's one, with a fall. A very unusual thing for him. M: And counting today, Yuzuru has completed 13 quads in 6 programs this season. A: How many has Uno Shoma done? M: 16, but in 7 programs. He has one Free more. However, yes, the average is similar. M: Is half a point. A: But in my opinion, the TES might even go higher, because I haven't seen the value for the Choreo sequence appear. But maybe I just missed it. This is the 3A with the fall. M: This is a Hanyu that is mature. 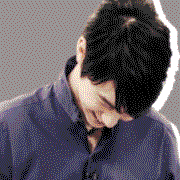 A Hanyu that listens to his body, and knows how he should answer to it. Let's remember that it's here that he won his first Grand Prix. This was already 7 years ago, he wasn't 17 yet. And today, we're expecting that he'll win the 10th GP in his career. With double digits in wins, we only have Plushenko, Yagudin and Chan. A: They're all heavyweight names. M: Because he didn't feel confident, it's okay that it's like that. A: Yes, yes. Also from that aspect, he could pay the price on the component score a bit, because he simplified it. It would be a correct conclusion and we can't say nothing else that case. M: Eventhough I'd be surprised to see him a lot under 90. But well, let's see how they judged this. We0re waiting for the score, let's remind that the TES was over 80. A: Yes. It was 82. M: 78.25. It has slightly dropped. The 4T-Eu-3S was under review. A: And maybe the Axel. M: 90.64 on PCS. He goes into the lead with a big margin. This is the first Free program of the day. He doesn't win on the highest TES though. A: No. Because Kazuki had 80.91.